With the popularity of home automation devices, smart appliances, and other electronic equipment in today's homes, the requirement for "whole house" surge protection has become a necessity. The bottom line is surges or spikes can actually destroy any sensitive electronics within the device we use in our homes — such as high-definition TVs, computers, refrigerators, microwave ovens and more. Damage can range from complete failure to a reduction in useful life. So how do you protect your home from these damaging surges You need to implement "Whole House Surge Protection," which requires three types of surge protective devices at three levels within the home. At the meter, the panel and the device, Leviton can protect you with a whole house surge protection network. Type 1 Surge Protective Devices are mounted on the line side of the main service entrance (between the utility pole and where your electricity enters your service panel). These devices protect against external surges caused by lightning or utility capacitor bank switching. Type 2 Surge Protective Devices are mounted to the load side of an electric service panel and protect against residual lightning energy and other internally generated surges, such as those caused by off/on switching of pumps, motors, HVAC units, etc. Type 3 Surge Protective Devices are typically used with TVs, computers, smart appliances and other sensitive electronic equipment. These devices provide point-of-use protection and are the last line of defense against voltage surges. Good-Surge protective outlet or surge protective strips to plug your tablet, refrigerator, or even your HDTV into. Better-Surge protective outlet or surge protective strips and surge protective panel that protects your main electrical panel. Best-Surge protective outlet or Surge Protective Strips and Surge Protective Panel that protects your main electrical panel and a Meter Socket Adapter you would install by your main service entrance (between the utility pole and where your electricity enters your service panel). 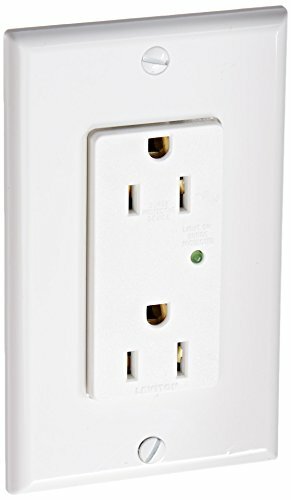 Leviton 5280 Decora Duplex Surge Suppressor Receptacle, single-gang matching wall plate and instruction sheet.